The display at the National Portrait Gallery. If you're in London over the next year a couple of small 17th century displays at the National Portrait Gallery are worth catching. Hidden: An unseen portrait of Oliver Cromwell (until 19th October 2015) explains how now techniques helped researchers uncover an earlier image of the Parliamentarian leader beneath the NPG's portrait of his fellow commander Hesilrig. Produced by an unknown artist 'around 1640', the Hesilrig portrait depicts the Leicestershire MP - one of the original Five Members who the king tried to arrest in 1642 and commander or the London Lobsters cavalry unit during the English Civil War - in full cuirassier armour. 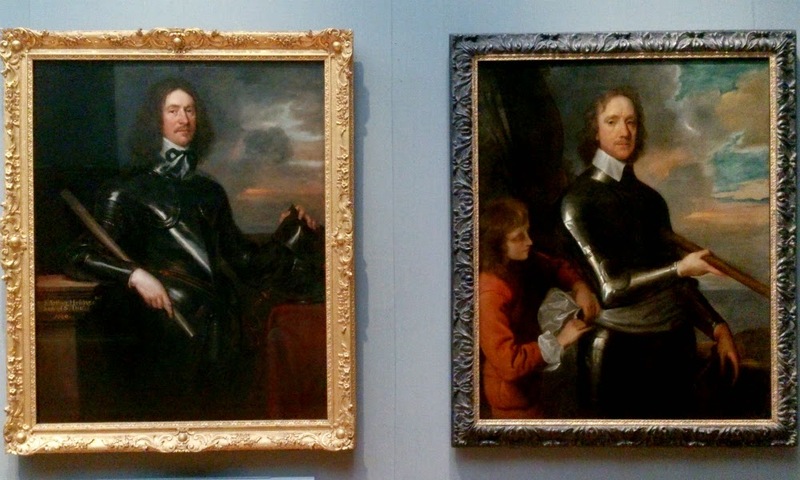 The pose, though strikingly similar to that of Cromwell in the adjacent 1649 painting by Robert Walker, perhaps seems unremarkable for a military portrait. However, researchers investigating suspected alterations to the left shoulder of Hesilrig uncovered a previous painting beneath the surface - the outline of which clearly resembles Walker's portrait of Cromwell (see image below). 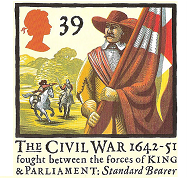 The centre image shows how infra-red techniques revealed the outline of Cromwell's left arm beneath the Hesilrig painting and the page boy tying the sash. The reason for the over-painting remains a mystery. Was the artist commissioned to paint Hesilrig working with a copy of the Cromwell portrait for sake of convenience? Or did Hesilrig have his own likeness painted over Cromwell after the two fell out after Cromwell took the title of Lord Protector in 1653? If the latter, it suggests the work was produced later than the 'around 1640' previously assumed. 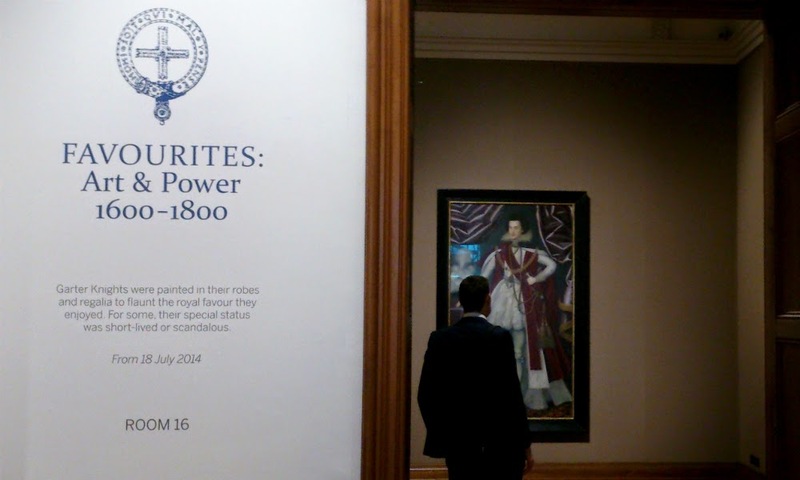 The second display, Favourites: Art and Power, 1600-1800 (until 1st September 2015), brings together a small collection of sitters invested as Knights of the Order of the Garter. 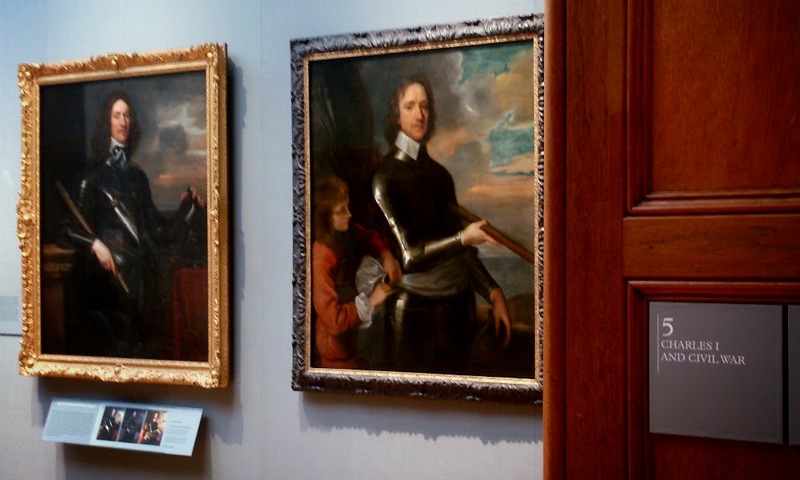 A couple depict 17th century figures: the first is the famous portrait of the George Villiers, 1st Duke of Buckingham, favourite of James I and his son, Charles. 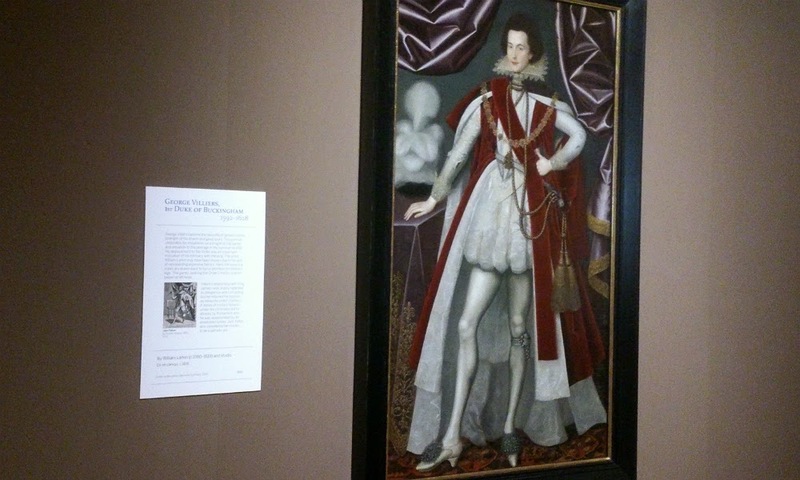 William Larkin's portrait of George Villiers, 1st Duke of Buckingham (c.1616). Painted around 1616 by William Larkin, the portrait celebrates Buckingham's installation as a Knight of the Garter. Each of those depicted in the small room reminds the viewer of the precariousness of royal favouritism: in Buckingham's case, the widespread distrust caused by his elevation eventually resulted in his murder in Portsmouth. The assassin was John Felton, a soldier who had served under Buckingham during his disastrous naval campaigns of the 1620s. Larkin was known for his skill in representing fine fabrics, and was probably chosen for his reason. Buckingham wears a large, luxurious rode in the portrait, but this feature comes a poor second to his long legs, the obvious focal point of the work. The second portrait is of Thomas Osborne, 1st Duke of Leeds. 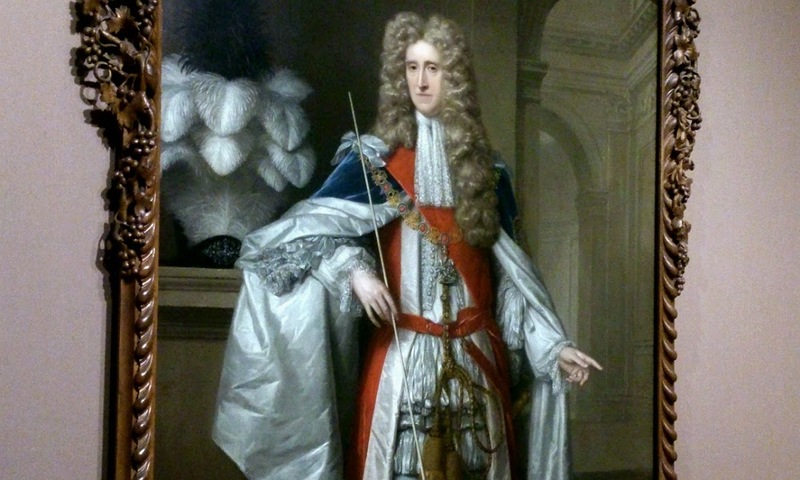 Osborne was chief minster to Charles II during the 1670s, receiving the Garter in 1677. His involvement in corruption, particularly in the user of bribery, made him also deeply unpopular, and he was later impeached and imprisoned. His fortunes revived under William and Mary, with his long and controversial career finally ending in 1712 when died aged 80. 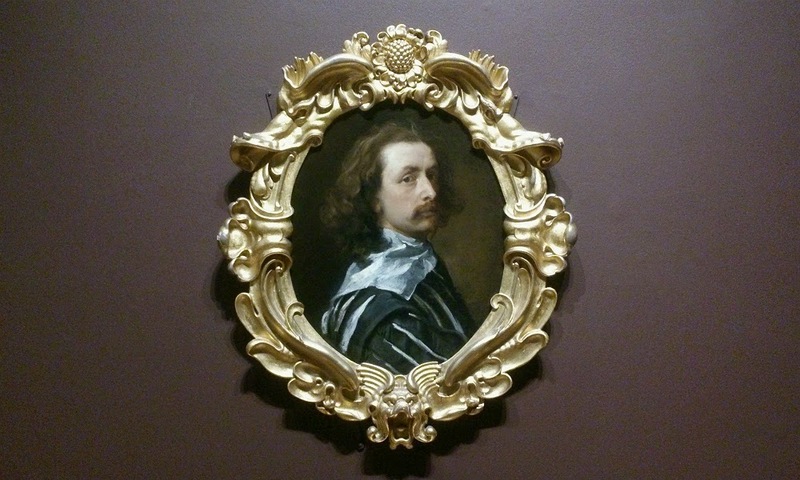 Van Dyck's self-portrait. The gallery is raising funds for its purchase. An unexpected bonus of popping into the 'Favourites' display waited outside in the corridor: the Van Dyck self-portrait the gallery is raising funds to buy. It's now been removed, but you can read all about the painting and the campaign to save it for the nation here.